The film industry organization that presents the Academy Awards is also developing young talent through a program called Academy Gold — an internship and mentoring program for students and young professionals from communities currently underrepresented in Hollywood. Some of the participants are either immigrants or children of immigrants who are trying to create an unorthodox career path for themselves. 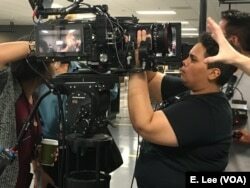 While many people come to Hollywood looking for fame in front of the cameras, Iris Lee prefers to work behind the lens. 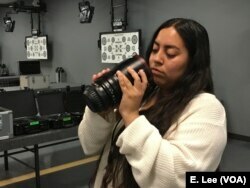 “I’m young, but I think I would really want to be a cinematographer in the future,” said Lee, who studied communications and film in college and graduated from the University of California, Los Angeles several months ago. She is now getting hands-on experience at Disney through the Academy Gold program. Angelica Reyes is from Puerto Rico. She attends the LA Film School. She is going to be a senior and she wants to be a cinematographer. in the Academy Gold program, she worked for Panavision, a provider of camera and production equipment. Lee was born in the United States, but her parents are from Taiwan, and convincing them of what she wants to do has taken some time. The Academy of Motion Picture Arts and Sciences, through its Academy Gold internship program, is trying to create more opportunities for the children of immigrants and other young talent who are underrepresented in what the film industry calls “below-the-line” jobs in Hollywood. These are people who work with cameras, in lighting, production and post-production. “The African American, the Latino, Asian American, women. We have a challenge in this industry of having women represented in some of our main labor categories,” said Edgar Aguirre, director of talent development and inclusion at the Academy of Motion Picture Arts And Sciences. In its second year, the 2018 program partnered with 26 film industry companies, including movie studios and content creators, to help undergraduate and graduate students succeed in the entertainment business. Interns had an opportunity to network and were paired with a mentor. In its inaugural year, 69 interns participated in the program. This year, the number of interns has grown to 107. “Ultimately the work we’re doing here is building equity. These young men and women are going to come up this industry together. They’re going to build on each other’s work, they’re going to be hiring each other within the next couple of years,” Aguirre said. Claudia Juarez just finished her first year of college in Los Angeles. She is interested in producing and directing. In the Academy Gold program, she worked at Panavision, a provider of camera and production equipment. Underrepresented communities will also tell stories from different perspectives, rarely seen on television or in the movies. Yemeni American Yousef Assabahi wants to present stories about the Middle East and specifically, Yemen. “There are a lot of TV shows where Yemen comes up in the TV show, but it’s considered as the hub of these fanatics and radicals that they have no goal in life but to attack the West and that’s untrue,” said Assabahi, who just graduated from the University of California, Los Angeles film school. Born in Yemen, he grew up traveling between the United States and his birthplace. He aspires to be a writer and director and tell stories about complex issues. “I like to explore things as a writer and I want to understand why people behave the way they behave,” Assabahi said. Academy Gold’s Aguirre said the goal of the program is to create a pipeline for underrepresented talent so there can be more diversity in Hollywood. About 50 percent of the interns from last year’s program were able to either find full-time jobs or other internships as a result of being in the program.